Beginning in 1935, in a series of devastating decisions, the Supreme Court's conservative majority left much of Franklin Roosevelt's agenda in ruins. The pillars of the New Deal fell in short succession. It was not just the New Deal but democracy itself that stood on trial. In February 1937, Roosevelt struck back with an audacious plan to expand the Court to fifteen justices-and to 'pack' the new seats with liberals who shared his belief in a 'living' Constitution. The ensuing fight was a firestorm that engulfed the White House, the Court, Congress, and the nation. The final verdict was a shock. It dealt FDR the biggest setback of his political life, split the Democratic party, and set the stage for a future era of Republican dominance. Yet the battle also transformed America's political and constitutional landscape, hastening the nation's march into the modern world. This brilliant work of history unfolds like a thriller, with vivid characters and unexpected twists. 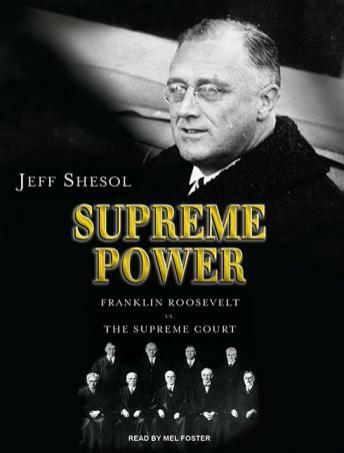 Providing new evidence and fresh insight, Jeff Shesol shows why understanding the Court fight is essential to understanding the presidency, personality, and legacy of FDR-and to understanding America at a crossroads in its history.